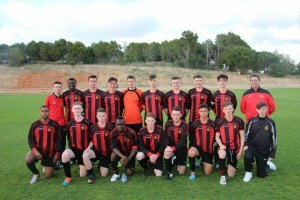 Malahide United under-18’s spent five days over the Easter break in Spain on a vital and memorable trip for their development. Between April 6-10 they played a series of friendlies and also took part in some elite Spanish style coaching sessions. On the first day the group departed Dublin Airport early and headed to Reus Airport, situated by the city of Reus and approximately 7.5 km from the city of Tarragona, in Catalonia, Spain. The first day the group headed to their accommodation at the Cambrils Park before having a free afternoon and evening with dinner at the Cambrils Park in preparation for the busy day to follow. The Tuesday consisted of a Masterclass training session with a Spanish coach before departing for the Futbol Salou Sports Complex. While there the group played their first friendly game of the trip, taking on Floresta B. Following that the group departed for Cambrils Park for dinner and then an early night ahead of another busy day. Wednesday began early as the Malahide United under-18’s left for Barcelona, where they were allowed free time around the city before heading to the famous Camp Nou stadium to watch Barcelona host Almeria. The giants of Barcelona trashed Almeria 4-0, witnessing the great Lionel Messi and Luis Suarez run the show on the night. Thursday it was game time once again; heading to Futbol Salou to face Academia Internacional Technifutbol. The group, weary following a tightly contested game, left for the Cambrils Park for rest. On the Friday the group departed CambrilsPark for ReusAirport and went back home to Dublin. For more information on such trips keep an eye on the blog here.